Apart from that, Allegiant is an entirely different story, entirely different. The book was confusing. I wasn’t pissed whilst reading, I wasn’t saddened, hell, I wasn’t evenbored. I was reading this book with a blank expression. Constantly I kept forgetting I was reading a book that’s a continuance of the Divergent trilogy. The terms “Divergent” and “Divergence” were a reminder that I was, indeed, reading the final installment. I’m sorry to say this, but: this was the dumbest book I’ve read in 2013. Honest to God I wish I had something nice to say about Allegiant. 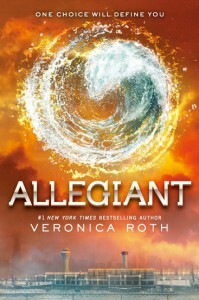 There's an attempt at a love triangle here between Nita and Tobias, there's an attempt at something unique with this story, but the alternating PoV between Tris and Tobias and everything I've stated above ruined everything. Also, I didn't like Tobias' voice here, Roth did not do a good job with portraying a male protagonist. I kept hearing a female voice in my head, constantly thinking it was Tris'. Did Veronica have this all planned out since the first book? If it was then it wasn't very good and thorough. This book is a flat out FAIL.